Josh Schlossberg is freelance journalist, a member of the Society of Environmental Journalists and editor for The Biomass Monitor, a page that tracks news and research around Biomass Energy. Biomass Energy has largely been given a pass as “green” by environmentalists, but should it? Biomass has largely fallen from the spotlight but it’s still going on, in fact in many area’s it’s increasingly being implemented, but Josh has done his homework and thinks that one reason it’s not being talked about much anymore is that frequently these projects are not nearly as green as they purport to be. Check out the Biomass Monitor homepage here, and you can find Josh on twitter here. Mary Evelyn Tucker is a Senior Lecturer and Research Scholar at Yale University where she has appointments in the School of Forestry, Environmental Studies and the Department of Religious Studies. Mary Evelyn joins us to dig deeper into the contents and impact of Pope Francis’ Encyclical. Particularly, we discuss the science heavy (for a religious proclamation) contents and tone and the effect this will have on the future of the climate and more generally the environmental movement. You can read more about Mary Evelyn Tucker here, and please check out the Forum on Religion and the Environment at Yale with lots of great links and articles here. Finally, regardless of your religious persuasion, even if you read it one paragraph at a time for the rest of the summer, you will need to make sure you read every word of the Pope’s Encyclical for yourself here. 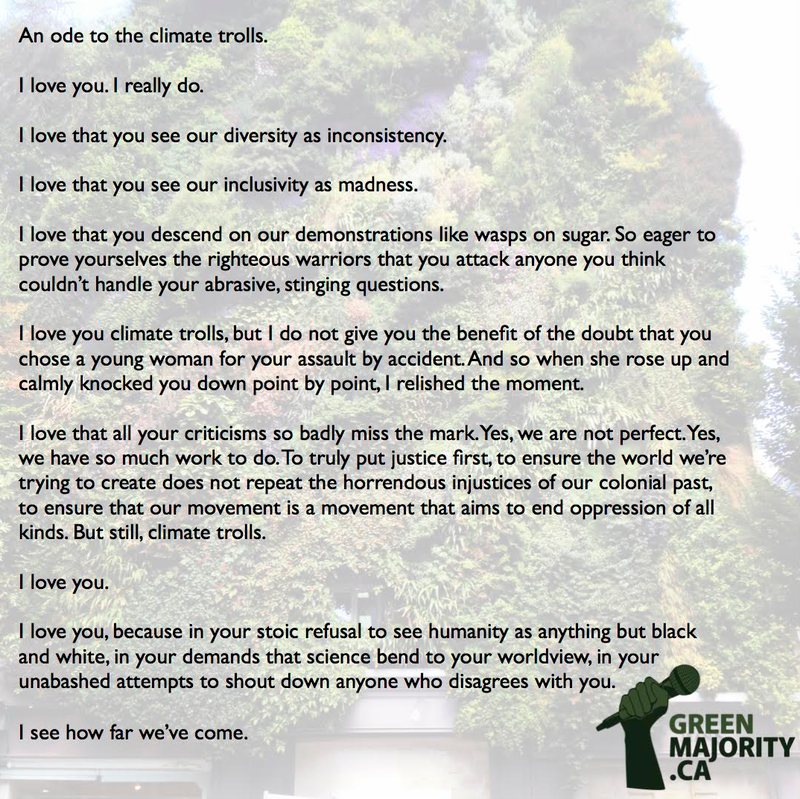 Finally, Stefan read us a short piece he wrote inspired by the recent “Jobs, Justice Climate” rally that saw 10,000+ people flood downtown Toronto last weekend called “An Ode To Climate Trolls”. Lot’s of news this week! We didn’t get much chance to talk about any of them, but some highlights from the news this week are below. Finally, I’m super confused what to think about this article in the Toronto Sun (Toronto’s most conservative newspaper).. which seems to make a strong argument for voting Green…. while saying it isn’t. WTF? Please read and we’d love to hear what you think about it in the comments below.